Sometimes the most heavily trafficked waterways are the least known to landfolk. Consider Newtown Creek in 2007. Tis true also of this waterway between New York and New Jersey, Kill Van Kull aka KVK. When I first moved here a half decade ago, I thought to kayak here, a plan I quickly discarded after seeing how heavily it’s trafficked. Until I found this article on Staten Island name origins, I wondered who the Van Kull is; check out “Arthur Kill” as well as “Het Kill van het Cull.” As a Dutch speaker and linguist, I find this Anglicization explanation finally satisfactory. 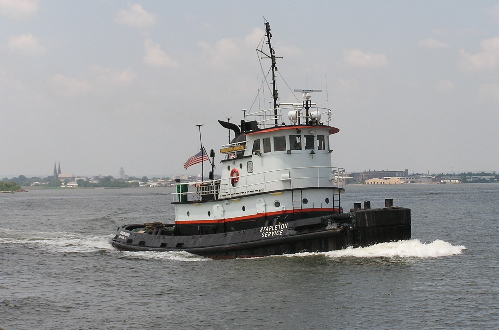 The tug below enters the west end of KVK about a mile on the Bayonne side of the Goethals Bridge; astern is visible the waterfront of Elizabeth, NJ. Just to the right of of the twin steeples of St. Patrick’s Cathedral is the shadowy tower of the Union County Courthouse; off the bow is the Singer plant that I blogged about a few days ago. 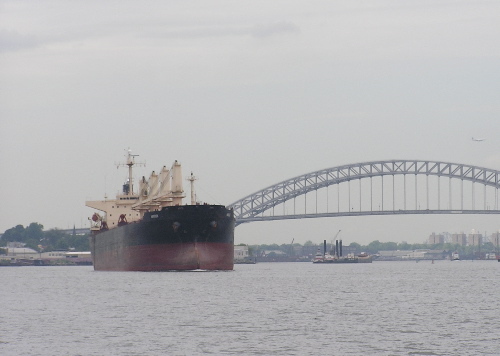 If Stapleton Service were to turn to port, it would enter Newark Bay, the busiest portion of the port of greater New York. 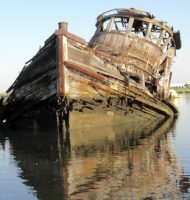 Of course, Newark Bay, which handles all this traffic, can only do so because of its shoreside transportation links–rail and road–as well as major dredging, which doesn’t even keep up with the increasing vessel size, or more accurately, depth. 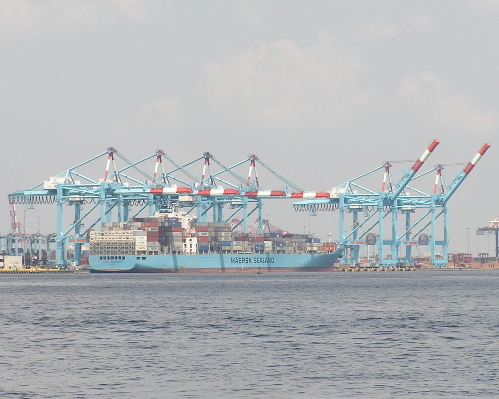 Check this link (scroll all the way through) for a Maersk container ship with three times the cargo capacity of the Maersk vessel above, three times, 300%!! 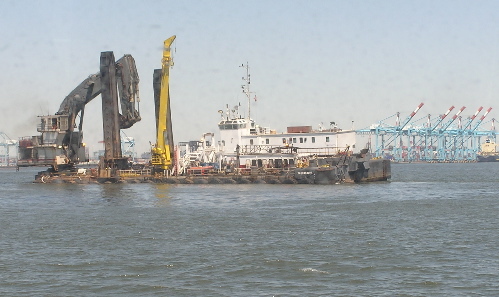 Notice this shovel barge is “spudded” in place; the spud is the pillar or foot just in front of the bucket of the crane. But dredging means mixing what has lain inert in the mud with estuary flow, and what has lain in the mud might be nasty. Given the traffic, KVK is home base for at least 100 tugs, according to an August 2005 article by Wendell Jamieson in the Times. 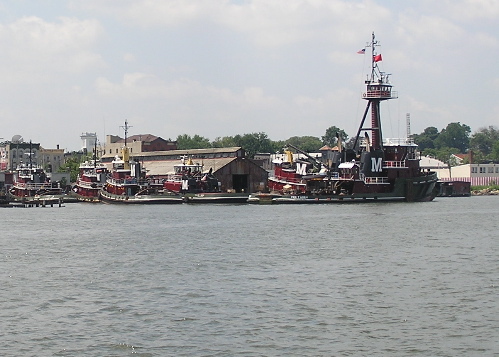 Moran is one of the bigger fleets. 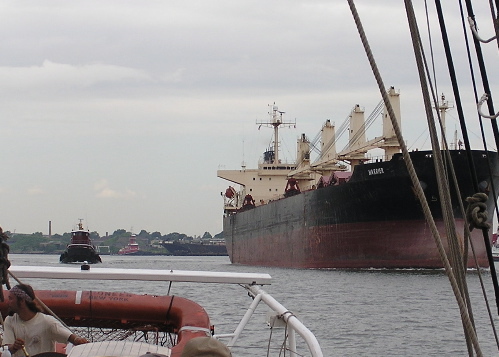 Here a fearless helmsman “stays the course” and checks room to starboard while a huge bulk carrier, flanked by a Moran tug, passes to port. 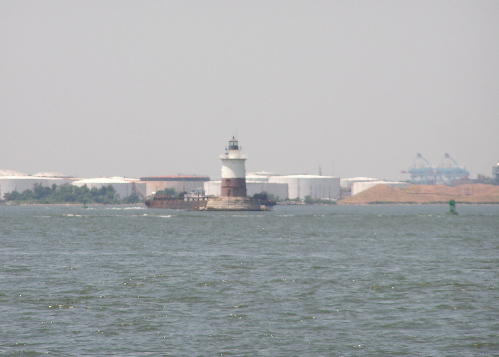 The east end of KVK is marked by Robbins Reef Light, shown below. So ends the KVK at its east end, but it’s all sixth borough, and the sixth borough . . . well, it connects to all the watery parts of the globe.